Otitis media, or a middle ear infection, is one of the most common infections your child may experience. When visiting with your pediatrician, they may initially be hesitant to prescribe antibiotics unless they believe the ear infection is caused by bacteria. Before becoming offended, it is important to know that the reason they are being conservative with antibiotics. This is due to the rising incidence of superbugs. Superbugs are created as different strains of bacteria become immune to antibiotics. If your doctor doesn't think your child has a bacterial infection, they should hold off on prescribing antibiotics. The Food and Drug Administration (FDA) does not recommend Belladonna for any use. It is, however, used in practice by homeopathic practitioners. Using Belladonna should be done with the utmost caution. Belladonna extract is derived from the leaf and root of a five-lobed flower that produces berries similar to black cherries. Belladonna actually means "beautiful lady" because women in Italy used to take the berry juice to dilate their pupils. This, however, was a dangerous practice. Belladonna extract when ingested has sedative effects. You will see this product sold typically in 1:10 or 1:100 concentrations. This is then usually further diluted. For example, if 1:10 concentration is diluted 30 times, the Belladonna extract would be labelled as 30D; whereas 1:100 concentration diluted 30 times would be labelled as 30C. In 2010, Belladonna was removed from teething products due to Belladonna toxicity found in children that led to several severe side effects, including seizures, difficulty breathing, and death. Pulsatilla is a flower that is used in homeopathy to treat earaches. It has been shown to cause localized irritation and should be avoided if possible or used cautiously under supervision. The irritation may cause allergic reaction and cause skin disorders. The parts of the flower that exist above the level of the soil are used in preparing dried pulsatilla. Dosing of this homeopathic supplement is typically taken three times a day either in the dried preparation or in tea or in alcohol. Typical dosing consists of 120 to 300 mg.
Data on using pulsatilla is not sufficient. However, there are concerns with birth defects if you take pulsatilla while pregnant. Of this list of homeopathic products, chamomilla is likely safe for use and is commonly used in many commercial products. Chamomilla is produced in several forms including: oral, inhalation, and topical. While generally considered safe, caution should be used when taking other supplements that have sedative effects like chamomilla. These substances may include: 5-HTP, St. John's wort, valerian, yerba mansa, and any other homeopathic remedy that causes sleepiness. Using multiple homeopathic remedies with a sedative effect will have an increased response: both positive and negative. There is a wide range of dosing due to the many different ways you can use chamomilla. While considered safe it would still be beneficial to discuss with your doctor. Mercury, or quicksilver, is available in many forms. All the available forms can be toxic given enough exposure. You may recall hearing about mercury coming from older thermometers, gold miners, suspected issues from dentistry (which carries no validity), and fish. There is also a concern from some in the general public related to the levels of mercury in thimerosol. Thimerosol is a preservative in some vaccines. The concern is in relation to an proposed increase in autism as a result of mercury in the vaccine preservative. However, this has no scientific backing whatsoever. While mercury in small doses will not harm you (as in fish), mercury toxicity is a problem that can lead to disorders related to your nervous system, kidneys, liver, and hair. Always consult a physician before using mercury in any form. Historically, colloidal silver was used to treat infections, burns, and other wounds. The use of colloidal silver diminished after the introduction of antibiotics due to the potential of silver toxicity. Colloidal silver is a liquid suspension that includes small particles of silver. The FDA classifies colloidal silver as GRAS, which means "generally recognized as safe." However, you should exercise caution to avoid toxic levels of silver. You should avoid ingesting more than 14 micrograms of silver per kilogram of body weight in 1 day (14 mcg/kg/day). So for a person that weighs 150 pounds or 68.2 kilograms, the person should not have more than 954.8 mcg a day. Taking more than this could result in an irreversible bluish skin tone (argyria), neurological disorders, and damage to other organs in your body. Xylitol is a natural sugar that can be found in fruit. In commercial products, you may see it used as an added sweetener. There is some growing evidence that xylitol helps stop the growth of bacteria, such as strep and influenzae. The most effective method of administering xylitol surprisingly appears to be in chewing gum with xylitol in it. Chewing gum may be 50 to 100 percent more effective than syrups or lozenges of the same concentration unless your child has ear tubes in place. Xylitol is more effective in prevention than in treating ear infections. Probiotics come in commercially available products to help restore your microbial balance. While some bacteria cause harm, many bacteria are useful in maintaining our bodily functions. There is still a lot of study that needs to be done on probiotic use. However, some small studies show benefit in reduction of sick days in children that receive oral probiotics (in a capsule). There is also some experimentation on a probiotic nasal spray to prevent ear infections. There are several herbal ear drop preparations that may prove to be beneficial for treating earaches associated with an ear infection. In some cases, the herbal remedies have been more effective in treating ear pain than anesthetic drops. One such product is Otikon Otic Solution. It contains a combination of St. John's wort, mullein, marigold, garlic oil, and olive oil. Otikon is considered phytotherapy, which uses natural substances without mixing them in synthetic substances. These types of ear drops are generally considered safe and has some support in research as being effective due to the herbs antibacterial properties. There are, however, some skeptics in the healthcare industry, and further study is still warranted. If you have ear tubes or a perforated ear drum, you should always discuss with your doctor before using any product that will enter into your middle ear space. 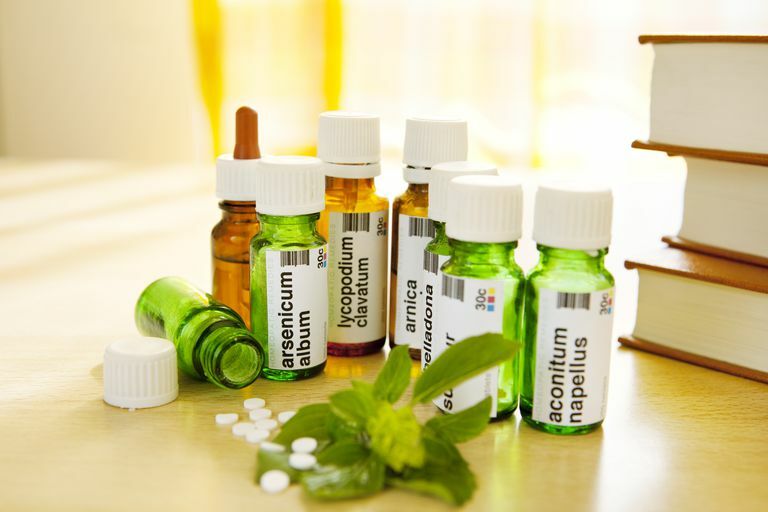 While homeopathic remedies are natural in origin, they are still medicine and will carry positive and negative side effects. Homeopathic remedies are not as well studies as modern medicine, so benefits and risks are not as well understood. Discuss these homeopathic remedies with your physician. Levi, JR, Brody, RM, McKee-Cole, K, Prbitkin, E & O'Reilly, R. (2013). Complementary and alternative medicine for pediatric otitis media. International Journal of Pediatric Otorhinolaryngology. 77:6, 926-931. Marom, T, Marchisio, P, Tamir, SO, Torretta, S, Gavriel, H & Esposito, S. (2016). Complementary and Alternative Medicine Treatment Options for Otitis Media: A Systematic Review.Medicine (Baltimore). 95(6): e2695. Mercury Toxicity. UpToDate website. Updated May 11, 2016. Natural Medicines. Food, Herbs & Supplements: Professional. Updated August 16, 2017.